Tuffy Trucks all share common wheels, axles, and cabs. All saw cuts are straight, no tricky curves. Includes FULL SIZE plans for all 11 trucks shown. Measure approx 7"H x 8" to 11"L. Tuffy Truck Hardware Parts include 2-1/2" wheels plus the turnings needed for headlights, clearance lights, etc. 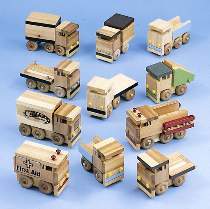 to build all 11 trucks shown in photo. In all, this 147-piece package contains 56 wheels, 60 axle pegs, and 29 assorted plugs and 2 decal sets.